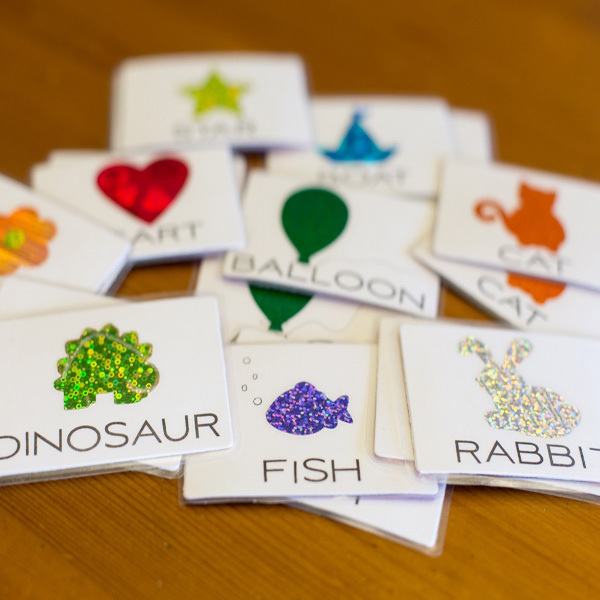 Project Description: Use brightly colored foil board and films to create a set of laminated cards to keep little ones busy during vacations – or any time of year. 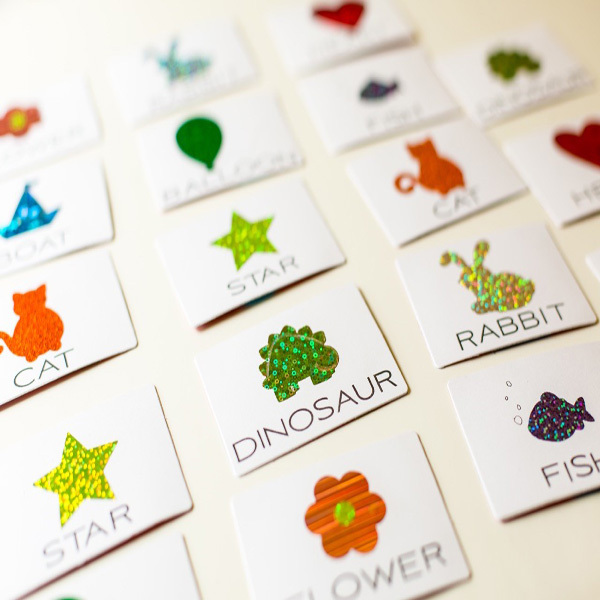 There are pairs of each image so the cards can be used to play a memory matching game, but they can also be used to help teach shapes, colors, and words. Note: This is a great way to get extra mileage from your die collection. If you don’t have dies, look for clip art shapes online that can be printed and used as a template to cut the adhesive film. 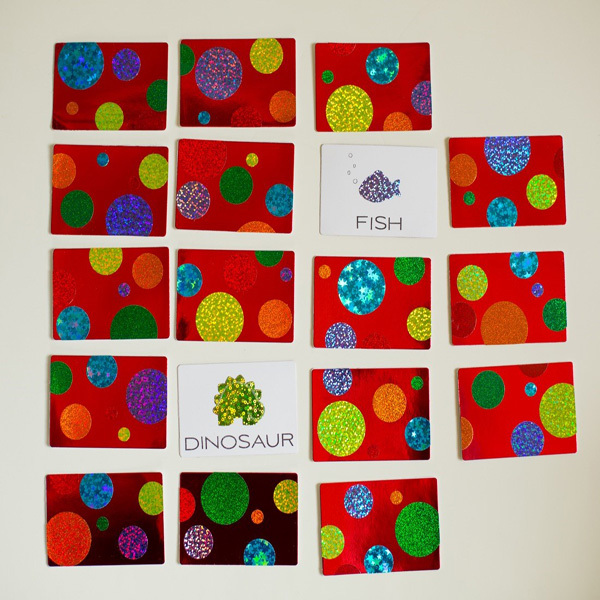 For each pair of cards die cut two Button Boutique dies from red metallic foil board and two from white cardstock. Die cut an assortment of circles in various sizes and colors from Funky Film. Adhere circles to the red foil board in a random pattern, allowing some of the circles to extend beyond the edge of the card; trim excess. Die cut two of the desired shape from the same color of Funky Film and adhere one to each of the white die cut cards. Use the alphabet stamps and black ink to stamp the name of the shape on the bottom edge of the card, as shown. Use the glue stick to adhere the red metallic card to the white card. Cut two pieces of matte seal (laminating) film slightly larger than card. Peel off the protective liners and adhere to the front and back of card. Press to remove air bubbles. (Note: the adhesive on the film allows for repositioning after application but will become permanent.) Use paper trimmer to trim excess film, leaving a thin border around the edge of each card. Use scissors to round corners. 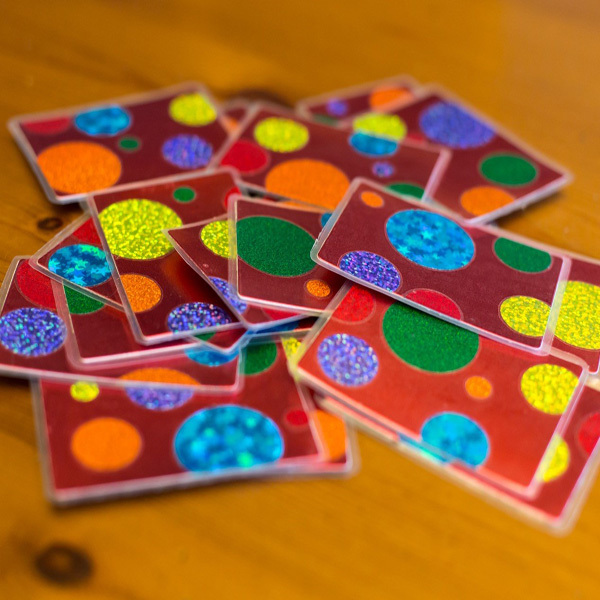 Shuffle cards; lay all the cards face down on a flat surface (A large rimmed baking sheet works great as a table to play games during long car rides). Each player takes turns flipping over two cards. If they match, the player gets to keep them both; if not, they are flipped back over in the same spot and the next player tries to find a pair. When all the cards are matched the player with the most pairs wins. Instead of creating a deck of cards with shapes, use photos of relatives that your kids don’t see very often. It is a great way to “introduce” children to family members that live far away.